Over the years, the Volkswagen car brand has chosen to use not only different passenger cars, but also vehicles for the business sector. One of these types was the VW LT. It was built from 1974 onwards and was eventually replaced in 1996 by a new VW LT 2 developed by Volkswagen together with Mercedes. Are you the owner of a VW LT that you use, for example, for your company? And were you, however, confronted with damage to the windscreen during one of your rides, for example as a result of rubble? In that case, we would like to propose an interesting solution for windscreen replacement VW LT! The fact that the VW LT is a car that has been developed for the business sector means that it is used very frequently. During a ride on the motorway, for example, a stone can fly against the windscreen of your VW LT at high speed. If this happens it can cause damage due to rubble. This damage can manifest itself relatively innocently in the form of an asterisk, but can also form a crack. In the latter case, the windscreen replacement of your VW LT is the only option available to you. Is it just an asterisk? In this case, it is preferable to have it solved as soon as possible. After all, an asterisk that at first glance appears to be innocent can quickly develop into a burst, which can increase the costs of solving the damage. Damage to your VW LT windscreen can of course also occur in other ways. What about damage caused by vandalism, for example? Someone with bad intentions can very easily damage the windscreen of your VW LT. In another situation, a shattered windscreen is caused by an accident. In both situations, it is absolutely essential to replace your damaged or broken automotive glass. It is a fact that replacing your VW LT windscreen is the only solution to the damage in question, but this does not mean that a damaged windscreen replacement is always legally required. Where does the name 'Volkswagen LT' come from? The LT behind Volkswagen is actually the abbreviation for 'Lasten Transporter'. In addition to the model indication, the numeric indication is also displayed. An example of this is LT 35. This numeric indication indicates the maximum authorised mass of the vehicle in question. The maximum mass in this case is therefore 3,5 tonnes. In addition, the first VW LT that appeared on the market had only a 4-cylinder in-line engine borrowed from the Audi 100. What does a windscreen of a car cost? Many people always choose out of habit to buy an after market car window when replacing a VW LT windscreen. That is all well and good, but the fact that it has a brand logo means that it can initially only be sold by authorised brand dealers. This results in a significantly higher cost than is strictly necessary. Fortunately, things can be done differently. By choosing an after market truck window, you choose for a financially much more interesting alternative and that without having to take into account a lower quality. Both types of windscreens are not only produced in the same factory, but also in the same production line. As a result, exactly the same quality is always guaranteed. Why is a windscreen more expensive than other car windows? 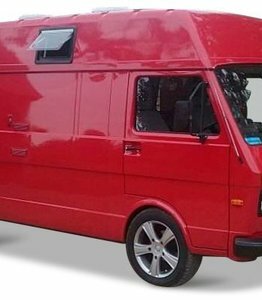 A windscreen replacement of a VW LT will always cost you a little more money than when you choose to replace one of the side or rear windows. Why is that? The higher price of a windscreen is caused by the fact that it consists of laminated glass. This laminated glass is made up of several layers of glass with a layer of PVB film in between. This film has an adhesive effect on both sides that is able to hold shards together in case of breakage. This prevents the fragments from falling into the faces of the occupants, thus providing an additional level of safety. This therefore justifies the slightly higher price compared to tempered glass car windows. In the event of glass damage, these will splash into countless pieces. The price for a VW LT windscreen can therefore be considerably reduced by choosing an after market car window. However, what about the cost of replacing the VW LT windscreen? This is because it is also influenced by the labour costs involved with the replacement. Here too, you do not have to worry. After all, the most optimal price-quality guarantee is offered by the FOCWA certified partners with whom we work. These experts have all the knowledge and experience required to efficiently carry out the windscreen replacement of your VW LT. Moreover, this can be done not only at one of the service points, but also on location. For example, has your windscreen been shattered and do you want to replace the VW LT windscreen at home or elsewhere? It is therefore possible without any problem!